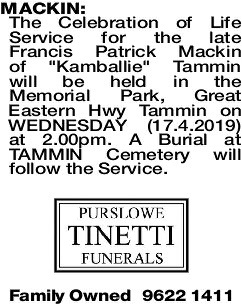 The Celebration of Life Service for the late Francis Patrick Mackin of "Kamballie" Tammin will be held in the Memorial Park, Great Eastern Hwy Tammin on WEDNESDAY (17.4.2019) at 2.00pm. A Burial at TAMMIN Cemetery will follow the Service. 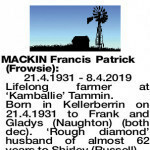 21.4.1931 - 8.4.2019 Lifelong farmer at ‘Kamballie' Tammin. Born in Kellerberrin on 21.4.1931 to Frank and Gladys (Naughton) (both dec). ‘Rough diamond' husband of almost 62 years to Shirley (Russell). Cherished dad of Denise and David (Goulden) and Shayne and Lisa Mackin. Frowsie to Jenna and Glenn, Aaron and Raelene, Ashley and Natalie, Simon and Dayna, Curtis and Holly. Great Frowsie to Matilda, Cameron, Jacinta, Jameson (dec), Darcy and Maisie (dec). Just as you were, you will always be. He was so loved. Love you big up the sky. Adored Dad of Denise (Squirt) and David. Frowsie to Aaron, Raelene and Maisie (dec), Jenna, Glenn, Matilda, Cameron, Jacinta and Jameson (dec). Our Frowsie, such an amazing example for us. So loving and giving. Your love for us was unconditional. Our hearts are shattered. So long Dad. Take care of our babies. You've done your last shearing Frowse. So sadly missed already by Shayne, Lisa (Leeza), Ashley, Natalie, Darcy, Simon, Dayna, Curtis and Holly. Thanks dad for everything. The legacy of Kamballie will live on through us all. A better brother I could not have asked for. Another link in the chain is broken. A true blue Aussie bloke and a great farmer. 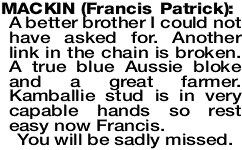 Kamballie stud is in very capable hands so rest easy now Francis. 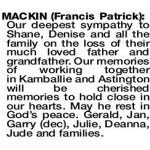 Our deepest sympathy to Shane, Denise and all the family on the loss of their much loved father and grandfather. Our memories of working together in Kamballie and Astington will be cherished memories to hold close in our hearts. May he rest in God's peace. Gerald, Jan, Garry (dec), Julie, Deanna, Jude and families. 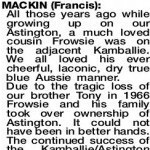 All those years ago while growing up on our Astington, a much loved cousin Frowsie was on the adjacent Kamballie. We all loved his ever cheerful, laconic, dry true blue Aussie manner. 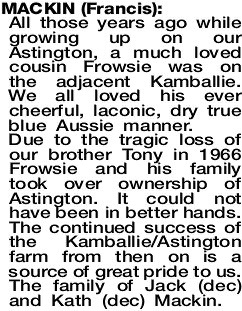 Due to the tragic loss of our brother Tony in 1966 Frowsie and his family took over ownership of Astington. It could not have been in better hands. The continued success of the Kamballie/Astington farm from then on is a source of great pride to us. The family of Jack (dec) and Kath (dec) Mackin. Sympathy to Shirley, Shayne, Denise and families for your sad loss. 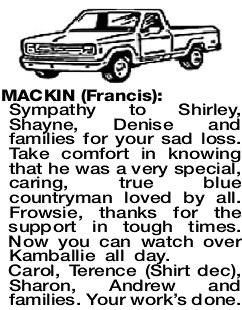 Take comfort in knowing that he was a very special, caring, true blue countryman loved by all. 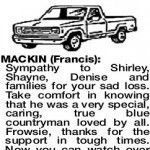 Frowsie, thanks for the support in tough times. Now you can watch over Kamballie all day. Carol, Terence (Shirt dec), Sharon, Andrew and families. Your work's done. 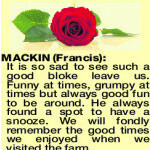 MACKIN FRANCIS It is so sad to see such a good bloke leave us. Funny at times, grumpy at times but always good fun to be around. He always found a spot to have a snooze. We will fondly remember the good times we enjoyed when we visited the farm. Deepest sympathy to Denise, Shayne and families. Geoff and Di Mackin and family. 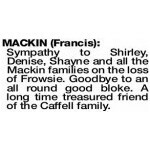 Sympathy to Shirley, Denise, Shayne and all the Mackin families on the loss of Frowsie. Goodbye to an all round good bloke. A long time treasured friend of the Caffell family. 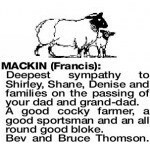 Heartfelt sympathy to all the family on the loss of Francis. Lifelong friend and former neighbour of the Ryan families. 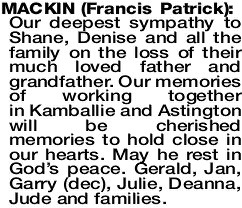 Deepest sympathy to Shirley, Shane, Denise and families on the passing of your dad and grand-dad. A good cocky farmer, a good sportsman and an all round good bloke. 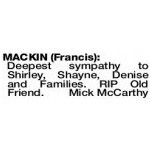 MACKIN FRANCIS Deepest Sympathy to Shirley, Shane and Lisa, Denise and David and extended family on the passing of Francis. 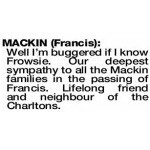 Frowsy was a true Champion of our club, be that on or off the green. 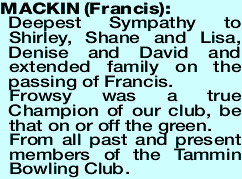 From all past and present members of the Tammin Bowling Club. Our love goes out to Denise, David, Shayne, Lisa and all the Grandies. An amazing man and wonderful friend of Peli, Kaye, Mark, Lee, Andrew, Gen and families. Well I'm buggered if I know Frowsie. 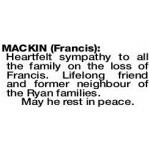 Our deepest sympathy to all the Mackin families in the passing of Francis. Lifelong friend and neighbour of the Charltons.